ASAP (American Solar Action Plan) is a non-profit organization building public understanding about how solar, wind and hydrogen produced from water can make the United States energy self-sufficient. 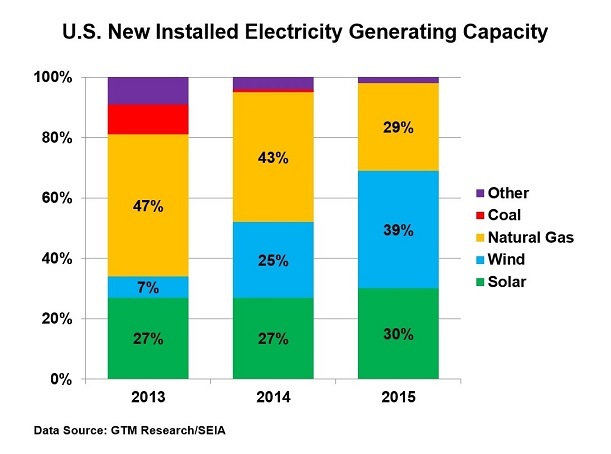 New U.S. solar capacity in 2015 was a record 7.5 GW (GigaWatts). Developments indicate that 2016 will be even better with over 14.0 GW of new solar capacity additions according to GTM Research/SEIA projections. Solar installations accounted for 30% of total new U.S. electricity generating capacity in 2015, and combined solar and wind capacity accounted for 69% of total new U.S. electricity generating capacity in 2015 as shown in the graph. Cumulative U.S. solar capacity stands at 27.5 GW with over a million installations. A very significant development is the Congressional mandated extension of federal tax credits for new solar and wind installations through 2020. This will enable solar to continue double digit annual growth rates. With federal tax credits now secure, new annual solar installations are expected to reach the 20.0 GW mark by 2021. While ASAP's "Solar Grand Plan" calls for 20.0 GW of new solar capacity for each of the years 2016-2020, the current solar growth forecast averages about 16 GW per year 2016-2020. The cost of solar installations continues to decline. GTM Research/SEIA solar cost estimates for the first quarter of 2016 are an average $3.21 per watt for residential rooftop solar installations, and the cost of utility-scale ground mounted solar installations averaged $1.24 for fixed-tilt installations and $1.41 per watt for tracking installations. The medium term solar cost outlook is expected to remain favorable with no expectations for a significant upward pressure on commodity prices. With commercialization of electric vehicles (battery and fuel cell), we are witnessing the emergence of a truly sustainable world energy future with stable energy prices and reduced greenhouse gas emissions. The world's energy future is looking better, but much work still lies ahead. The oil and gas industry would have us believe that fracking is the solution and that we can delay development of solar/wind electricity and electric vehicles. This is not true. We need to stay on top of developments and to continue promoting the efficacy of super-large-scale wind, solar, and electric vehicle development. The size of the U.S. energy system is gigantic, and it will take decades to build out the needed solar/wind power plant capacity at affordable growth rates. We're on the right path, so let's keep plodding ahead in 2016 and forward. All the pieces of this world-changing plan actually exist and have been described in the January 2008 Scientific American “Solar Grand Plan” article, which was co-authored by ASAP. The object is to stabilize energy prices for generations to come by adopting the lowest cost, unsubsidized solar and wind production and distribution systems. We believe it is only a lack of public awareness that prevents the Plan from being immediately adopted. 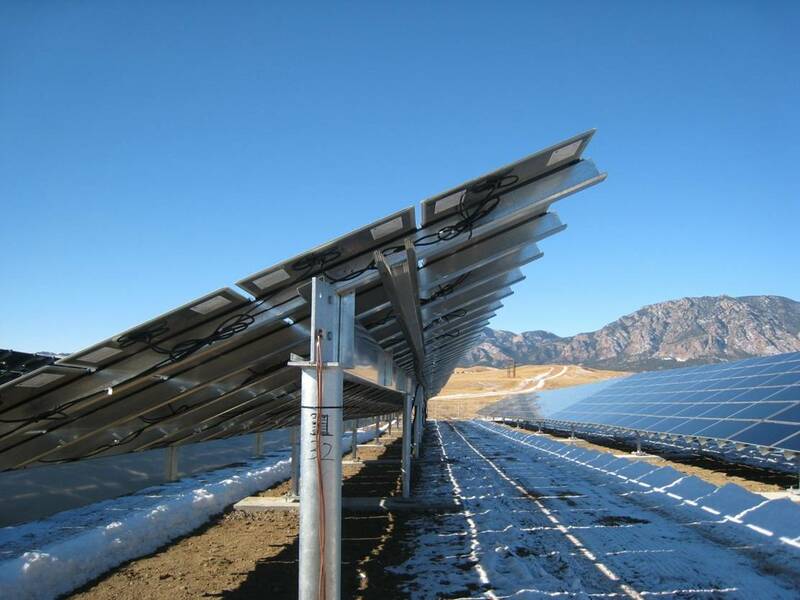 Construction of PV solar plants in the sun-rich desert Southwest and wind farms in the wind-rich Midwest. Construction of compressed air energy storage (CAES) power plants to firm intermittent solar and wind electricity into a dependable supply of electricity, 24/7, year-round. Construction of an interstate HVDC transmission system to transport solar and wind electricity nationwide. Construction of electrolysis plants to produce hydrogen from water to be used as a transportation fuel. Independence from foreign oil with the development of a hydrogen production and distribution system to support fuel cell electric cars, buses, and trucks. Development of a national electricity transmission system to distribute lowest cost solar electricity from the Southwest states and wind electricity from the Midwest states to local markets throughout the U.S.
Intermittency is a major problem for solar and wind energy, but ASAP has identified a solution with the application of compressed air energy storage (CAES) power plants, which are described in the Scientific American article and in published peer-reviewed research papers. With the coupling of solar and wind electricity to CAES plants, intermittent solar and wind electricity can be transformed into a reliable source of electricity 24/7. Also, the adoption of electric cars is important if we truly want to end our dependence on foreign oil since transportation accounts for 70% of U.S. oil consumption. ASAP is excited about the performance of hydrogen fuel cell electric cars and believe that they will be acceptable to the public since they do not require long battery recharging time. In a few years, ASAP foresees the ability to produce massive quantities of hydrogen by electrolysis of water using solar electricity at a price to drivers equivalent to the price of gasoline today (refer to the published peer-reviewed solar PV-Hydrogen research paper). Energy self-sufficiency will allow us to expand domestic jobs and economic well-being while providing us with a sustainable energy path throughout the 21st century. The use of carbon-free solar and wind electricity allows us to reduce CO2 emissions by 92% below current levels, literally ending the threat of global warming. Chile inaugurates Latin America's largest solar photovoltaic power plant, 100 MW. Abengoa has brought online the world´s largest tracking solar PV plant, the 206MW Mount Signal Solar farm in California. Buffett orders $1B of Wind Turbines! Warren Buffett’s utility company's order for about $1 billion of wind turbines shows how a drop in equipment costs is making renewable energy more cost competitive. The DOI has approved two solar energy projects located near the Nevada-California border, to supply 550 megawatts. Abengoa has brought online the US’s first large-scale solar plant with thermal energy storage system, at 280MW. PG&E in California is analyzing a site for CAES potential.